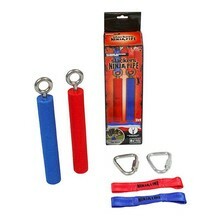 Train like a Ninja with the patented b4Adventure NinjaLine 30' Intro Kit with seven hanging obstacles. 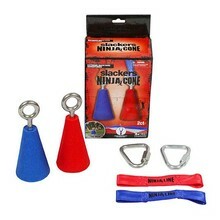 This kit allows the versatility of moving the obstacles further apart as your skills improve as well as includes obstacles that vary in skill level. Easy to install and take down means that you can take your training with you. 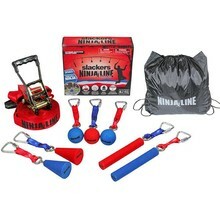 Includes: storage bag for easy portability, 30' x 2" slackline webbing with steel ratchet and rubberized grips, a three piece 10" nylon rope Monkey Fist, a two piece 16" Monkey Bar Hold, and two piece gymnastics rings with textured grips. 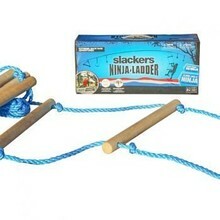 All obstacles include steel hanging delta safety clips. Hang in between two posts or healthy trees.